Ask RP Photonics for advice on any aspect of solid-state gain media, e.g. concerning the spectroscopic characterization or the optimum use of laser gain media. Particularly in the context of solid-state lasers, one is often dealing with Stark level manifolds where degeneracies are lifted by the influences of the crystal field. As a consequence, absorption and emission transitions between Stark manifolds have a significant spectral width (bandwidth). The wavelength-dependent transition strengths are described with effective transition cross sections. In the 1960s, Dean E. McCumber at Bell Laboratories worked out a detailed theory  – now called McCumber theory – to explore the quantitative relations between various optical properties of laser gain media such as molecular gases but also rare-earth-doped or transition-metal-doped gain media. He made use of thermodynamic principles, following earlier (and less general) theoretical investigations of Albert Einstein. which relates the frequency-dependent effective transition cross sections σabs for absorption and σem for emission to each other. The quantity E0, which depends on the temperature but not on the optical frequency ν, can be calculated from the energies of the single Stark levels, if these are known. Otherwise, one can obtain an estimate based on the assumption that the level energies within each Stark level manifold are equidistant . Alternatively, E0 can be calibrated e.g. using the reciprocity method or the Füchtbauer–Ladenburg equation. For ytterbium-doped gain media, E0 is often close to the photon energy of the zero-phonon transition, i.e., the transition between the lowest sublevels of both manifolds. The results of McCumber analysis are usually fairly accurate for laser crystals. However, the accuracy for rare-earth-doped glasses is substantially worse, particularly in cases with dominantly homogeneous broadening . The McCumber relation is very useful e.g. 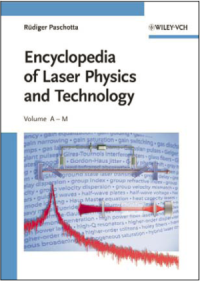 for evaluating the weak absorption cross sections on the long-wavelength side of a laser transition. Calculating the absorption cross sections from the emission cross sections can be much more precise than directly measuring the weak absorption. Also, the spectral shape of the intrinsic fluorescence can be calculated from the absorption spectrum. This can be advantageous when direct fluorescence measurements would be affected by reabsorption in a highly doped sample, or by excited-state absorption.